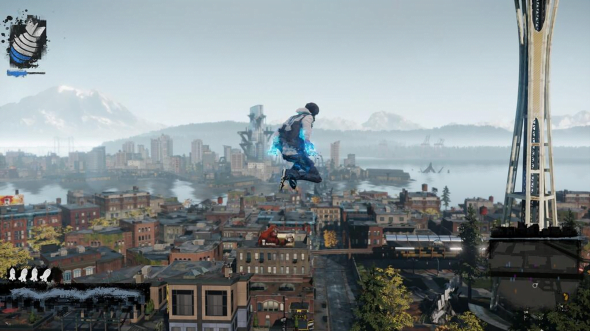 Dimitri sat down with Sucker Punch’s InFamous: Second Son. Here’s what he had to say about the game. While dashing through the air as a puff of smoke, you look down to see a man restrained in a yellow vest being attacked by a crowd of anti-bioterrorists. You land on a building near the attack, contemplating what you will do. The neon from a nearby sign buzzes into your eyes and ears, prompting you to drain the neon straight from it. You zap your way down to the attackers and, without lifting a finger, your very presence scares them off, allowing you to revive your fellow Conduit. A block away, you hear an anti-Conduit protest going on. Why not go stop it with a nice highly concentrated blast of neon? The seven years that have passed since the events of InFamous 2 have not made relations between Conduits and the general public any easier. Seattle has been overrun by the Department of Unified Protection (DUP), a group designed to hunt down all remaining Conduits. Delsin Rowe, protagonist and member of the fictional Akomish Native American tribe, is thrown right into the mix. The story sets Delsin up as an anti-establishment punk graffiti artist, always at a cross with his cop brother. When he accidentally comes in contact with a Conduit, he discovers that he has the ability to siphon the abilities off of other Conduits. 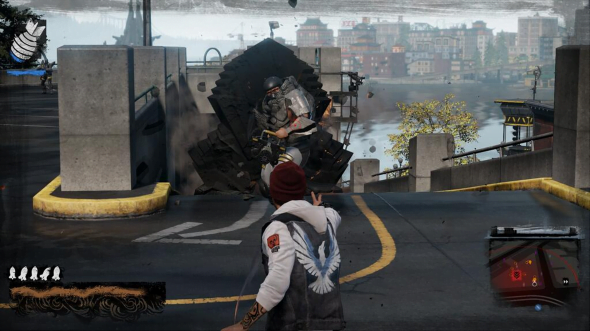 Upon discovering this, a Conduit-turned-DUP agent attacks Delsin and injures members of his tribe. Delsin’s movements are smooth, and getting around town is a blast. The plot’s main point is for Delsin to acquire a specific Conduit’s power and save his tribe but it seems to forget that at times. It isn’t a particularly strong plot to begin with and is sometimes subjugated by the overlapping Conduits vs. DUP story. The focus shifts back and forth between the two in terms of importance. I understand that Sucker Punch wanted to use the attack on the Akomish as a jumping off point for Delsin to enter the complex world of the Conduits, but it’s all a little messy. Still, it is paced well enough and drives the events forward. The story features a few touching and interesting moments but there is no cause for much merit. Just as in the previous InFamous titles, there are moral choices to be made throughout the game. At certain points, the game will freeze and you will be forced to make a black and white/good or bad choice. These will affect your powers, interactions with certain characters, and the final ending of the game. You won’t find yourself caring too much about most of the choices, however. They generally revolve around characters we don’t care about quite yet and will mostly serve as a means of acquiring good or bad karma. Due to Delsin’s Conduit-sponge ability, he must track down other Conduits to gain their powers. A few essentially become your allies, but are only seen or heard from in a couple of choice story moments. They are set up as interesting characters with deep backstories yet are underutilized. Being able to call them in to help fight every once in a while would have been nice but they are largely forgotten in the base game. The weak story is only hampered by the side missions – or lack thereof. There are no real side missions at any point in the game; rather, the map is riddled with “side activities”. Each district features the same ones. Shooting a camera, finding an audio log, spray painting a wall, or chasing down an undercover DUP agent to name a few. Most of them take no more than a few seconds to complete before moving on. The entire map can be cleared of these side activities within an hour or two. 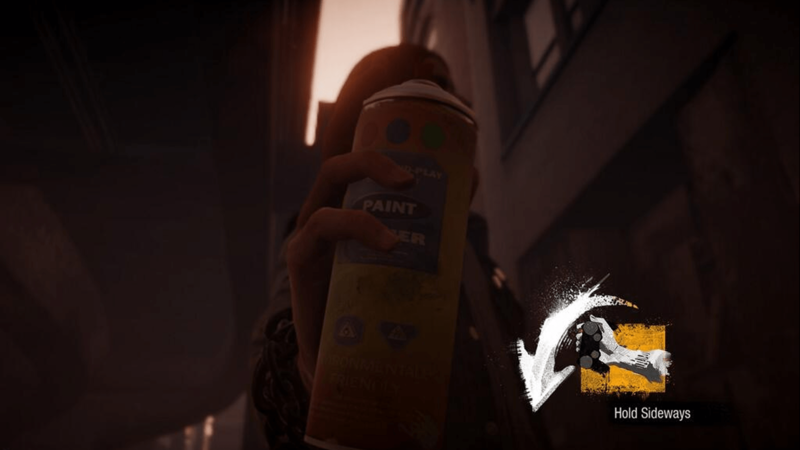 Spray painting utilizes the DualShock 4’s motion capabilities. As a Seattle native, the prospect of being able to explore the Emerald City with a host of superpowers at my side felt right. I had hoped for a more or less plot-for-plot recreation of Seattle but I was disappointed. While certain landmarks and district names are accounted for, the city is inaccurate enough to the point where they could have just named the city something else entirely. Sucker Punch took a lot of creative liberties in their Seattle, including creating a giant fake river that cuts the city in half. Seattle in Second Son has apparently suffered an impossible cataclysmic tectonic disaster that pulled the city in two like a slice of cake. In addition, many important landmarks, tourist attractions, and stores were entirely left out or unrecognizably changed. They don’t even use real local news channels during television reports. It’s understandable that a lot of these issues may be due to copyrights and the like, but the immersion was definitely killed for me. I felt as though I was exploring an almost foreign city with a Space Needle. While a great open world, it doesn’t quite feel like Seattle. To qualify, I don’t hate the city in Second Son by any means; it just doesn’t reflect good implementation of the rainy city’s assets and shouldn’t have been advertised as such. It is still a well-constructed open world environment and is about as fun to explore as the powers you use to explore it. Though it never quite feels like Seattle, it would be careless not to mention how gorgeous this game is. The water effects are like nothing I have seen to date on console. The way it pours down a wall or how the sun reflects off of a fresh rainfall is stunning. In addition, the facial animations are supremely lifelike. This is definitely one of the best open world games I have yet to see. That being said, a few small touches, like seeing yourself reflected in a window or puddle, are left out, yet only slightly hamper an otherwise unmatched demonstration of the visual prowess of this generation of consoles. Expect to fight a few million of these guys. 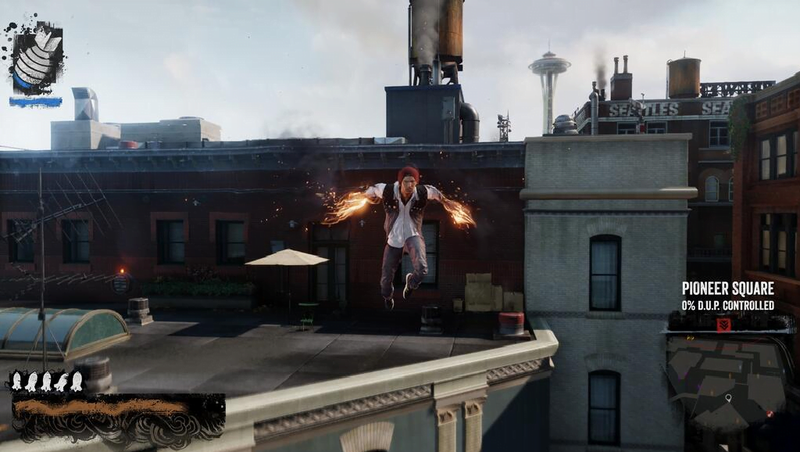 The city is an enjoyable sandbox for Delsin to flex his superpowers. Each power, of which there are four in total to choose from, provides a unique set of attack abilities as well as means for traversing. Smoke, for example, allows you to puff from one place to another while neon allows you to run quickly over and around objects and up the sides of buildings. The change from one to four powers was a great choice and keeps the gameplay from ever feeling stale. When not floating or zapping your way through the city, you will be in constant combat. The assortment of abilities makes virtually every encounter entertaining. Each power features unique melee, ranged, heavy, and distraction abilities. Certain attacks and powers may be better at dispatching certain enemies resulting in challenging and satisfying combat encounters. However, there are very few base enemy types, not including the occasional helicopter or turret, and they all attack with somewhat similar basic abilities. The combat is always fun, but there isn’t a lot of variety in the encounters themselves. Boss fights, on the other hand, are challenging and creative for the most part. Despite an uninteresting story, I found myself marveling at the fluidity of the powers at Delsin’s disposal. The fast-paced combat will go down as some of the most well-done in a superhero game to date. Zipping around Sucker Punch's Seattle is so great that I found myself never wanting to use the fast travel system. Apart from playing the game again to see the other moral side’s powers and outcomes, there aren’t many reasons to continue playing after finishing the base story as the side activities only serve to make Delsin stronger. Second Son is enjoyable from a gameplay and technical perspective but falters in terms of story and the lack of fulfilling side activities. I had a lot of fun playing the game and it definitely fit the comic book superhero vibe they were going for, but the game should have been much more than it was.